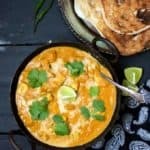 My creamy, velvety Instant Pot Vegan Butter Chicken with Tofu is a quick and easy spin on an old favorite, without losing the flavor. This gluten-free recipe can be nut-free and oil-free. 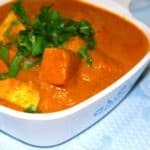 Of all the Indian restaurant recipes I’ve posted on this blog, one of your top favorites has been my Tofu Makhani, a silky orange gravy flavored with spices and herbs. Today I have for you an easier and quicker version of this recipe: My Instant Pot Vegan Butter Chicken with Tofu. Going vegan does not mean giving up the foods you love, and that’s the reason why I veganize so many recipes for you that I once ate and enjoyed as an omnivore. And it’s especially easy to get rid of the meat when you have a spicy, flavorful makhani gravy or curry that you can simply remove the chicken from and replace with tofu or chickpeas or even lentils. The beauty of a makhani gravy — and perhaps the secret to its popularity — lies in the fact that it encompasses all of the six flavors: spicy, salty, sweet, sour, bitter and astringent. Balancing those flavors in your gravy gives you a food that’s, in two words, perfectly delicious. Beyond imagination. 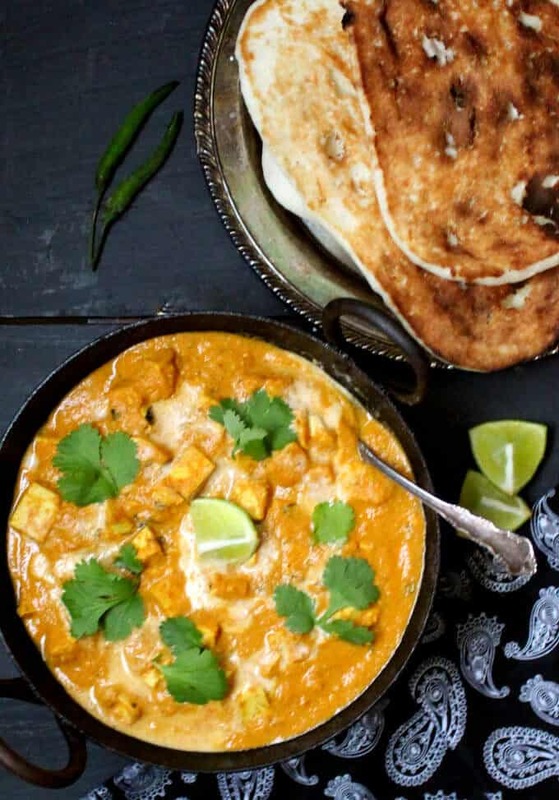 It takes barely 30 minutes to take this Vegan Butter Chicken from start to finish. Really. And if you cook Indian food with any regularity, you probably already have many of the spices in your pantry. I use superfirm tofu in this recipe, but you can use other substitutes for the meat. 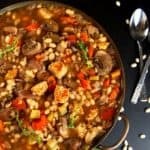 Chickpeas, lentils, and even veggies like cauliflower, brussels sprouts, mushrooms, green peppers, eggplant, squash, or a mix, would work well. Use canned tomato puree instead of fresh, if you want to get from start to finish even faster. You can make this recipe free of any added oil (not fat-free) by sauteing your tofu in the first step in a couple of tablespoons of cashew cream. In that case, make a little more cashew cream — you also need 1/4 cup of it to stir into the gravy at the end,. Use vegetable stock instead of water to add more flavor. Whatever you do, do not substitute the cashew cream with coconut milk. There is sometimes a tendency among nut-free vegan cooks to use coconut milk as a substitute in recipes, including Indian recipes. 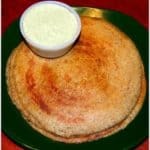 While this is fine in many cases for South Indian recipes, because coconut is eaten liberally in the south, North Indian recipes (including butter chicken) rely on cream and butter for creaminess and very rarely incorporate coconut. Coconut adds a very specific taste that will change the flavor of your butter tofu. If you are nut-free, use a vegan butter instead of the cashew cream. Stir in a couple of tablespoons of it at the end. 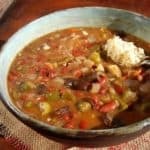 You can make this recipe on the stove top or in a pressure cooker. 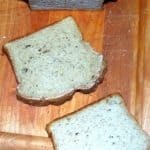 See recipe notes for how-tos. Whew. 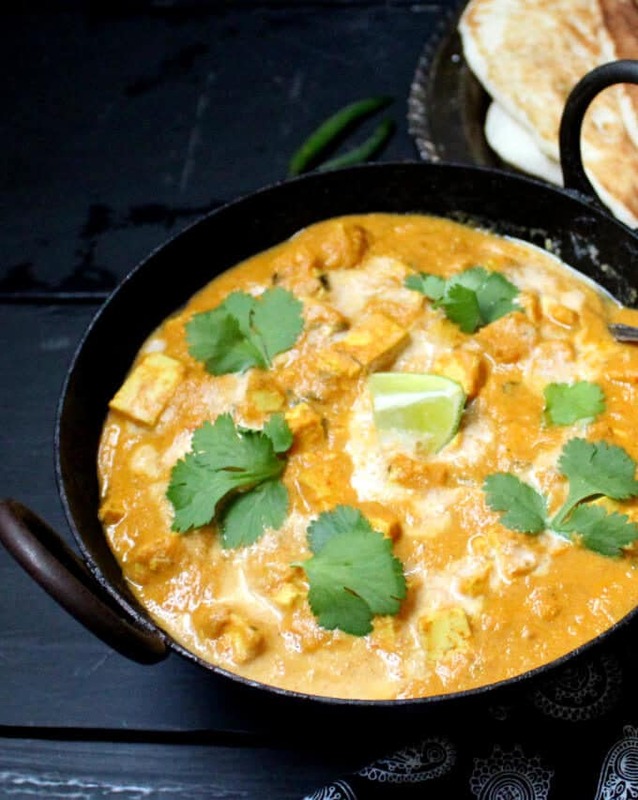 Okay, so now that I’ve got that stuff straightened out for you, let’s dive into this recipe for an Instant Pot Vegan Butter Chicken. You’ll truly be amazed by how simple it is. 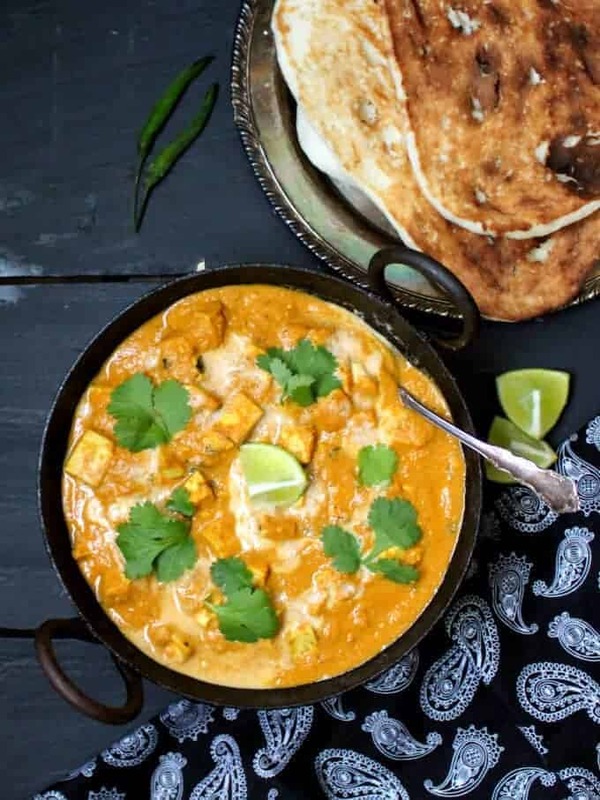 Serve this Instant Pot Vegan Butter Chicken hot with naan or roti or rice, and a few wedges of lemon and onion for a complete, healthful and memorable meal that you’ll be asked to make again and again. 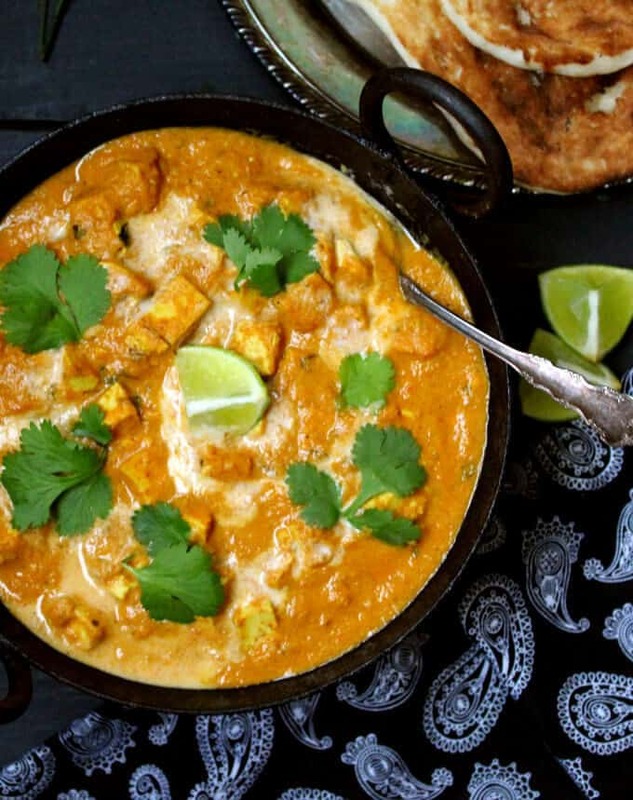 This creamy, velvety Instant Pot Vegan Butter Chicken with Tofu is a quick and easy spin on an old favorite, without losing any of the flavor. A gluten-free recipe. Can be nut-free and oil-free. Blend the cashews with 1/4 cup water or vegetable stock into a smooth paste and set aside. Blend the onions, garlic, ginger and the paprika with 3/4 cup water or vegetable stock. Place the tofu cubes in a bowl and add half a cup of the onion-ginger-garlic-paprika puree to the bowl. Toss the tofu cubes in the puree. Set the Instant Pot to the saute function. Add the oil and when it's hot, add the tofu cubes. Saute, stirring frequently, about 2-3 minutes. Then add the remaining onion-ginger-garlic-paprika puree, the tomato puree, coriander powder, cayenne and kasoori methi. Add salt to taste, give it a stir, and put the lid on. Set the Instant Pot to cook at high pressure for 10 minutes. After cooking is complete, release pressure manually after 10 minutes. Open the lid. If the butter tofu is too thick, you can thin it out with more vegetable stock or water. Stir in the garam masala, cashew cream or vegan butter, maple syrup or sugar and lemon or lime juice. Add more salt if needed. Heat the butter chicken tofu, especially if you added more stock or water, by turning the saute function back on. 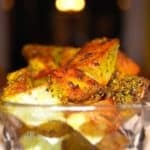 Once it's warmed through, remove to a bowl, garnish with coriander leaves, and serve hot with naan or roti or rice. Make this quick and easy butter tofu in a saucepan. Saute the tofu and the onion-ginger-garlic mixture in oil for about five minutes over medium-high heat, then add the tomatoes, saute until they turn a couple of shades darker and moisture has evaporated, then add spices and proceed. Let the curry cook about 10 minutes, then proceed with step 5. Just made this for dinner! I had all the ingredients. I can’t believe how easy it was to make. My house smells divine and I can’t wait for the family to chow down. Hi Sona, so happy you tried it– thanks for letting me know! Just got my InstaPot! So happy to try you IP recipes! Partway through this the IP said food burn. I had to stop it and add more water. I added 3/4 c. bc I figured that was the balance in the 1/4 cup for cashew paste of the 1 c in the recipe. It finished our fine, but then was soupy. Perhaps my puree wasn’t the same consistency. But the FLAVOR is over the top! I want to inhale it! So thank you! Hi Denise, I should have specified you need to add the 3/4 cup water or stock while pureeing the onions and garlic. I’ve clarified now– thanks for pointing it out. I made this last night and it was wonderful. Thank you so much for the tasty recipe! Everyone loved it, disappeared fast. 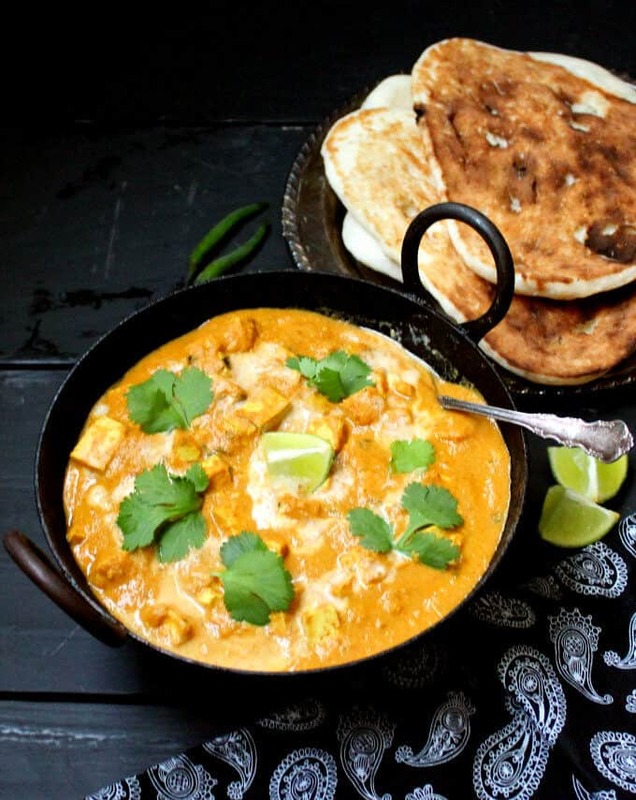 Butter Chicken was always a favourite dish and I’ve missed it until now. Followed your recipe, thank you for non-instant pot instructions too. I did not have fenugreek Greek, I reduced cayenne to 1/4 tsp and I made 3/4 cup cashew cream and used some of it and cashew milk to cook my tofu blocks– Avoiding Oil. The result was a nice non-oily butter chicken flavour. Elisa, that sound awesome. So happy you enjoyed it! 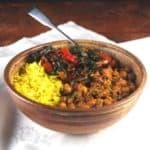 I purchased dry fenugreek and made this again — wonderful! As with all your recipes this one was another big hit. Can’t wait to try the Tofu Makhani. Happy you liked it, Mary! Thank for letting me know. Truly the most perfect food I’ve tasted. Thank you. 🙂 Thanks Manny! Happy you tried. 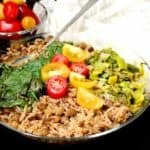 I made this recipe with and without Kasoori Methi. Without is good but using Kasoori Methi enhances the flavor to another level. This recipe is a definite keeper! 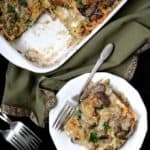 Thank you for your blog and great recipes. That’s great feedback! Thanks, Leanne. OMG! I don’t have an instant pot thingy but easy enough in a saucepan. Have made the Tofu Makhani before (amazing), and tried this recipe today using sliced Quorn ‘chicken’ fillets. The recipe starts with ‘blend the cashews…’ but I cannot find the quantity of cashews needed. Only that 2 tbsp of cashew cream is needed.